Retro Friday is a weekly meme hosted here at Angieville and focuses on reviewing books from the past. This can be an old favorite, an under-the-radar book you think deserves more attention, something woefully out of print, etc. Did any of you ever struggle with American literature in high school? I did. In fact, I developed a strong British bias early on as a result of being forced to read the slogging, long American works before any of the mind-blowingly awesome ones. I continue to feel this was a failed strategy. I mean, I still cringe whenever I think about The Grapes of Wrath, and it took all the way till college to discover that Steinbeck was actually awesome, when my professor slapped a copy of "The Chrysanthemums" in my lap. Same goes for Hemingway. Who knew his short stories were incredible? When it came to high school, it wasn't until they handed us The Catcher in the Rye and A Separate Peace that things got interesting. And then Fitzgerald came along and it was like, where have you been all my life F. Scott? 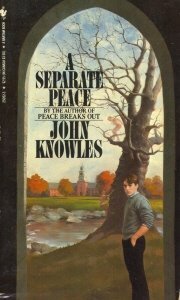 We read A Separate Peace in 10th grade, and I had a copy with the middle cover above. I still do, and to this day that is how I picture Gene. At least, I've always assumed it was Gene. Finny somehow seemed to me too large, too dark, too chaotic a personality to try to represent on a mere cover. I do love this cover, though, because it is both beautiful and menacing at the same time. Those of you who've read it will know what I mean. Gene Forrester attends the prestigious Devon prep school in New England. During the period leading up to World War II, Gene shares a dorm room with a young man by the name of Phineas. Finny. Finny is everything Gene is not. Popular, handsome, athletic, and happy. Gene envies his roommate his easy manner and way with life. The two become close friends, and Gene's feelings come to torment him, particularly as Finny is as nice as he is talented. He seems to care little for his reputation or status and so Gene lives under the shadow of both his friend's prowess and the crushing guilt of his own emotions. Then one day Gene's actions (as nebulous as they may be) cause a disastrous event. And the relationship between the two boys will never be the same again. As the war draws ever closer, the boys of Devon prepare to be drafted and boast of how well they will match up to the requirements of war. Meanwhile, Gene and Finny wage their own war of sorts, between reality and memory, shaking the ground their friendship is built upon. It is this silent war that will determine the remains of their lives, far more definitively than the one taking place across an ocean. I went back to the Devon School not long ago, and found it looking oddly newer than when I was a student there fifteen years before. It seemed more sedate than I remembered it, more perpendicular and strait-laced, with narrower windows and shinier woodwork, as though a coat of varnish had been put over everything for better preservation. But, of course, fifteen years before there had been a war going on. Perhaps the school wasn't as well kept up in those days; perhaps varnish, along with everything else, had gone to war. I didn't entirly like this glossy new surface, because it made the school look like a museum, and that's exactly what it was to me, and what I did not want it to be. In the deep, tacit way in which feeling becomes stronger than thought, I had always felt that the Devon School came into existence the day I entered it, was vibrantly real while I was a student there, and then blinked out like a candle the day I left. Now here it was after all, preserved by some considerate hand with varnish and wax. Prserved along with it, like stale air in an unopened room, was the well known fear which had surrounded and filled those days, so much of it that I hadn't even known it was there. Because, unfamiliar with the absence of fear and what that was like, I had not been able to identify its presence. Looking back now across fifteen years, I could see with great clarity the fear I had lived in, which must mean that in the interval I had succeeded in a very important undertaking: I must have made my escape from it. I felt fear's echo, and along with that I felt the unhinged, uncontrollable joy which had been its accompaniment and opposite face, joy which had broken out sometimes in those days like Northern Lights across black sky. How is it possible for one opening passage to induce smiles, tears, and a deep sense of foreboding all at once? A lot of it has to do with remembering how utterly without abandon I fell into this story the first time I read it, when I, too, was fifteen. Just like Gene. And part of it is, like Gene, knowing what's coming and being so afraid of getting there and so helpless to turn back. But most of it is simply the mild, thoughtful writing, the mingled fear and nostalgia, and the wonderful, wonderful characters. If you've never had the chance to pick this one up, I envy you the experience of meeting Finny for the first time. You won't meet his like again. Like Gene, you'll be drawn to this magnetic young man who has everything going for him, who loves sport more than anything on this earth, and who is all set to become the most stellar soldier there ever was. With his personal set of commandments, his Super Suicide Society of the Summer Session, and his invention of blitzball, Finny is the world. For himself, for Gene, and most certainly for the reader. Which is, of course, why the events of the story have such a strong impact. I think these two have been in the back of my mind ever since I read this book for the first time sophomore year in high school. And I'm not sure I've passed judgement on either of them yet. What I do know is I've loved the name Finny ever since, and when we had our little boy earlier this year, Finn was at the top of the list of names. Though I hope my boy doesn't share all of the same qualities with this character, we call him Finny every day. And it always makes me smile. I wrote my high school senior paper on A Separate Peace. It's definitely a good one (and writing the paper on it made it a certainty that I would never ever spell separate incorrectly again). I had a similar reaction to The Grapes of Wrath. Too many slogging history chapters--the dust, the cars. This sounds wonderful! I'd never heard of it before. It's going on my list. I heart retro Friday. 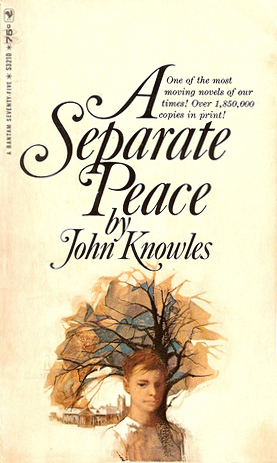 True story: I read THAT SCENE in A Separate Peace at lunch at school one day, and I ended up in my English teacher's room crying in her lap. Oh how I loved this book when I read it in HS! Sadly, the memory of the story has faded, but I have not forgotten Finny. Must. Read. Again. Thanks for the reminder! JoLee, I had to laugh because I remember the paper I wrote on it so well, too. And I feel bad about my feelings toward THE GRAPES OF WRATH. I do. But not enough to read it again. Simone, ooh, yay. I do hope you enjoy it. Diana, oh NO! I would have been an absolute wreck had I read it at school. Or in any public place, really. Gah. It still kills me. Melissa, it's just one of those good ones. Perfect for HS. And Finny is one of the good ones all right. This one is new to me, but I wish it hadn't taken this long to hear about it. I will have to get a hold of this one. Thanks for the heads up. okay, so i need a list of all the books american kids read at school because i feel like i missing out on something here, because we read all british classics. This is a favorite young adult book from years ago and I don't think there's a replacement yet. I've read and re-read it quite a few times. Like you, it's impossible for me to put it down once I begin skimming it and I still own my original copy. Thanks for the review. OH, this was one (along with The Catcher in the Rye) was also one of my favorite books from high school English. I really do need to read it again. I suspect I will like it even more as an adult. Ryan, oh, I think you might love this one. Such a great exploration of friendship and rivalry between boys. Carla, I've always wondered if British kids read any American lit in school or not! Question answered. We, obviously, read a ton of British lit as well in high school. Think you would love this one, btw. Janice, my lips are sealed. ;) But it is beautiful. Hilcia, ah, I'm glad others re-read it, too. My copy is worn by now. Holly, yeah, it wears just really well. Especially because we now have some of that adult perspective Gene has by the end. Oh how I loved this book. I based my book, What I Was, on it, and named the main character Finn after Phineas. Amazing how some books stick in the mind forty years after you read them. And people want to know why writing for teens is so important???? Meg, thank you so much for sharing that. Ever since I first read WHAT I WAS, I've connected the two books in my mind. The beginnings are both so beautiful, looking back in time at what happened at school. And it certainly cemented the name Finn as a favorite. But I had no idea it was intentional! Awesome. A Separate Peace by John Knowles shows great examples of how dramatic it is to be an adolescent. This book is written in first person. Throughout this novel the protagonist, Gene's, feelings of admiration and abhorrence towards his roommate and best friend at the Devon boarding school, Phineas, grows to the point where Gene is too confused to focus on reality. 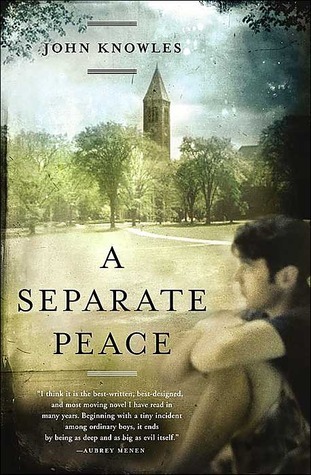 I would recommend this book for those who love suspense.A Separate Peace takes you to a boarding school at Devon, New Hampshire during the summer of 1942. Gene, the main character and the narrator, is smart, cunning and mildly physically active, but not as active as Phineas. Phineas could easily be the best athlete at Devon. One of Phineas's nicknames was Finny. Together they start a Secret Society for those brave enough to jump out of a limb of a tree over a river.